Saint Cecilia’s bears eloquent testimony to the demographics of nineteenth-century Boston. 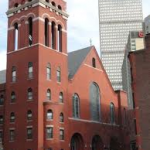 Irish Catholic staff in the service of fashionable Back Bay families appealed to their bishop for a church closer to their live-in employment. 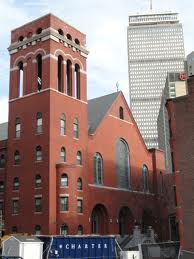 In 1888, a site was eked out, countless small contributions making the present church possible by 1894. Its sober New England exterior quickly discards reticence in favor of Italianate exuberance within. 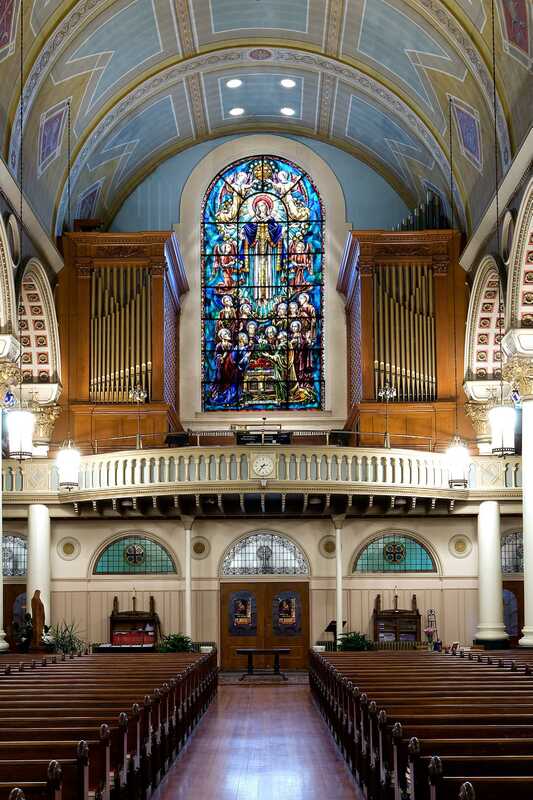 Recent renovations proved exceptionally sympathetic to the church’s original fabric, including its generous acoustic. Not until 1902 did the church order a modest two-manual from Hutchings-Votey, with twenty-four stops and electric action in a central gallery case. At the church’s renovation in 1954, Rostron Kershaw divided the instrument into its present arrangement. Roy Carlson advised on tonal design. Beginning in 1995, Timothy E. Smith organized a rebuilding project. Ted Gilbert, a veteran of Casavant, Austin, and Aeolian-Skinner, took charge of voicing, transforming a “cigars-and-brandy” sound into something of real virility and melodic ascendance, underpinned by a hefty Trombone and capped by a broad Tuba. 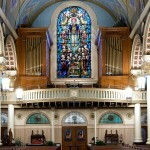 A seven-rank chancel section with roots in a 1960s Noehren unit organ came on line in 2001. Andrew Smith recycled an 1850 Simmons case to clothe it, while Timothy Smith and Gilbert injected the pipework with testosterone as they had in the gallery. Most recently, the four-manual, Aeolian-Skinner console, formerly at St. Philip’s Cathedral in Atlanta, was installed in the gallery.